When I was a kid, I was pretty loyal to one network when it came to my Saturday morning cartoon viewing habits. I always watched ABC. They had Scooby-Doo, The Blue Falcon and Dynomutt, Captain Caveman, Laff-a-lympics and other favorites of mine. On the superhero front they were the home of the Superfriends. But starting in 1979, ABC was also home to one of the most unusual superheroes. The one and only Plastic Man. 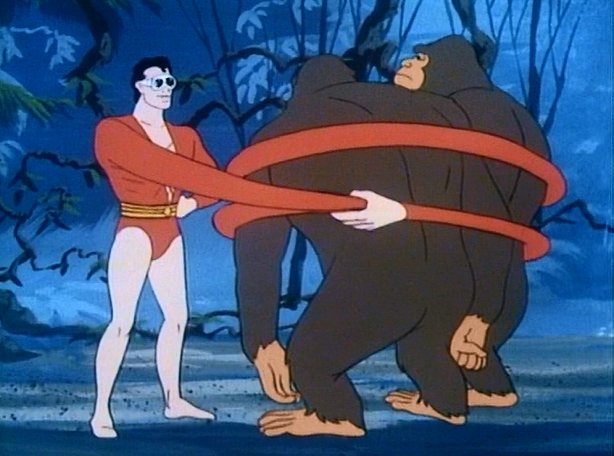 I think what I loved the most about Plastic Man was that his adventures had much more of a comedic edge than was the norm for other superhero shows. Plus, he had the best power out of anybody! I mean he could basically turn himself into anything. He didn’t just stretch like Mr. Fantastic, he become any shape. In Frank Miller’s The Dark Knight Strikes Again Plastic Man is referred to by Batman as being one of the most powerful superheroes there is. I see his point! As a kid I loved watching the huge variety of things Plas would turn into. 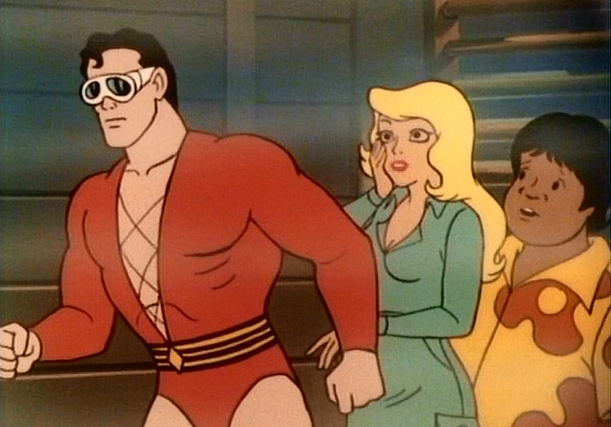 I don’t think I realized at the time how powerful of a superhero he was, but I do know that back then if I had to pick which superhero I wanted to be…it would’ve been Plastic Man. The villains on the show were just as bizarre as Plas was. A few were carry-overs from the comics, but the vast majority were new creations for the show. These characters were nuts! For example, there was The Weed…who is essentially part human part plant. We also had the likes of The Clam…who was, you guessed it, a Clam in a sea captain’s outfit. 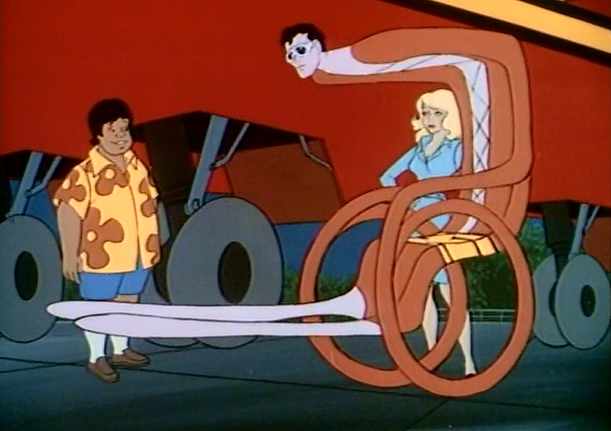 The Plastic Man cartoons actually appeared as part of a longer show that was called The Plastic Man Comedy/Adventure Show. There were several other recurring segments, many of which had a superhero angle to them. Unfortunately, only the Plastic Man segments are currently available on DVD. Among the other features were Mighty Man & Yukk, which was about a tiny, Ant-Man style superhero, who also owned the world’s ugliest dog. Yukk wore a dog house-shaped helmet on his head and we never saw what his face actually looked like. If we had the TV screen would’ve surely cracked. There was also Fangface & Fangpuss which was about a couple of superheroish werewolves, and Rickety Rocket which was a Scooby-Doo style segment about a group of futuristic teens with a talking spaceship. Eventually there were even segments focusing on the growing Plastic Man family, specifically Baby Plas, who had the same powers as his father. I just received the Plastic Man DVD set for my birthday a few months ago. I haven’t had the chance to share it with my kids as of yet, but am definitely looking forward to it. Perhaps soon I’ll be covering these episodes more in depth here at Channel Superhero. They are crazy fun and well worth revisiting. I love Plastic Man. I really loved Mighty Man and Yukk. Glad to see a fellow old dude, lol.